In Laos, thousands of varieties of rice are grown by local farmers. Years ago the government, along with the assistance of the International Rice Research Institute (IRRI), began to catalogue all the species and varieties grown within its boarders as part of the National Rice Research Program germplasm bank. Laos is the 2nd highest contributor towards this international germplasm bank having contributed 15,000 varieties. Through its work with the IRRI, Laos has also begun using modified rice varieties. Varieties that allow for greater yields and hardiness against the elements. By 2004, 80% of farming households had adopted modified varieties. 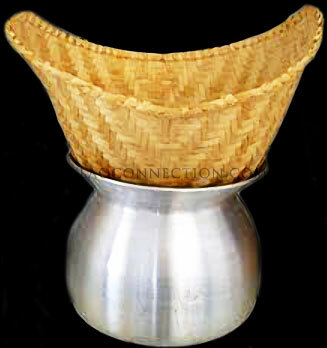 There are two main types of rice that are most common in Laos. Kow chow which is cooked by boiling in a pot. 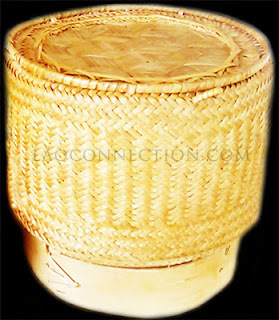 Kow niew, sticky or glutinous rice, that must be pre-soaked and then cooked by steaming in a bamboo holder. There is quite a bit of starch in rice. This starch part of the rice is called amylose and amylopectin. These starch molecules are essentially what determines how soft and sticky the rice will be. And often the higher the starch content, the more filling it is when eaten. There are two main varieties of kow niew grown in Laos. A white or light beige variety is eaten during most meals using your hands. There is also a popular darker variety called kow gum which is used in Lao desserts or snacks. Laos produces and consumes the most glutinous rice for any country. In fact, Laos is probably one of the few countries where sticky rice is a staple food. It is now sometimes said that a mark of Laoness is the eating of sticky rice. In fact many Lao people will indicate that if there is no sticky rice in a meal then it feels incomplete or unfilling. Kow niew has one of the lowest percentages of amylose at 2% (or lower) but with a higher level of amylopectin. Therefore, the rice becomes soft and sticky when cooked. Also, because it is lower in amylose, it therefore has a higher gylcemic index number so sticky rice is not recommended for diabetics however kow chow is ok.
Rice is very healthy, easy to cook and easy for our bodies to digest. Rice to Asians is like bread and potatoes to Westerners. It is an integral part of most major meals that acts as a carbohydrate filler. Laoconnection.com - How to Evaluate Good Rice? In Asian history, it has been said that the rise and fall of empires have often depended on its ability to cultivate rice and lots of it, if possible. 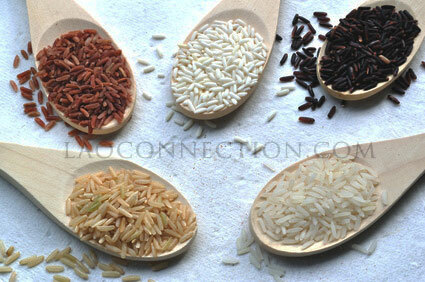 Rice is an integral part of almost every Asian diet and for some it also serves as their livelihood. It is worth noting that there are there are other parts of the world that consume a lot of it as well. They include the Middle East, Latin/Spanish countries, and Europe's Mediterranean region.